Exact date of birth unknown. This boxer's last name was often reported by contemporary newspapers as being either Griffith or Griffiths. The Ring magazine once recorded his last name as "Griffith." (November 1930, p. 47). Earlier, it had reported his last name as being "Griffiths." (April 1930 issue, p. 65.) He preferred to be called "Jerry," not "Tuffy," and some of his bouts were billed that way. He also went by the moniker of the "Pender Pounder." Griffiths was raised in Sioux City, Iowa, and grew up in Pender, Nebraska. He attended Northwestern University. Brother of Buzz Saw Griffiths . After his professional boxing career ended he was stationed at the San Diego Marine Corps base as a boxing instructor. (The Ring magazine, June 1948 issue, p. 28.) Griffiths died Nov. 15, 1968, age 61, at Sheridan, Wyoming. He had been a patient at the Veterans Administration Hospital in Sheridan, Wyoming, for a number of years. Inducted posthumously into the Greater Siouxland Athletic Association Hall of Fame in 1981. Gerald Ambrose Griffiths was born in Macy, Nebraska, the son of James Alfred Griffiths (1875 – 1933) and Rose Jane Girardo t(1874 – 1956). He had three brothers and two sisters. His brother Buzz Saw Griffiths was also a boxer. 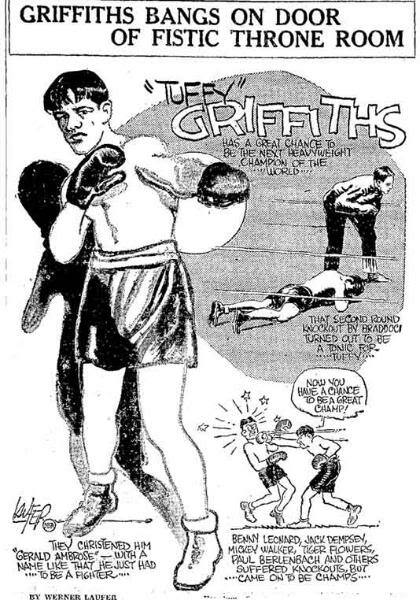 Griffiths fought his first professional bout on December 11, 1925 in Omaha, Nebraska. His debut was a successful one, defeating Donnie Dundee in 6 rounds. Jack O'Keefe was the manager of Griffiths. Griffiths actually preferred to be called by the name "Jerry" and not "Tuffy." He stood at 5' 11. All of Griffiths early fights were fought in the Midwest. In order for him to gain more notority he moved out and headed for the New York City. Many media outlets were reporting that Griffiths was not beaten in over 50 consecutive matches when he arrived on the East Coast. Fighting his first fight in Manhattan at Madison Square Garden on November 30, 1928, he fought James J. Braddock. Griffiths was suppose to be fighting former champion Pete Latzo that night. However, in a tune-up match for the Griffiths bout, Braddock broke Latzo's jaw in four places. Braddock was the only other choice to fight Griffiths that night. Griffiths was a 7-1 favorite to win the match against Braddock. As expected Griffiths dominated the first round of the fight, but Braddock fought back viciously in the second. Braddock ended up getting a second round knockout and shocked the whole boxing world. This single match launched Braddock's boxing career. A reenactment of this fight is featured in the movie Cinderella Man. When the plans for the next important heavyweight battle are made, it is going to be difficult to overlook Max Baer, the handsome entrant from Livermore, Cal. In the Chicago stadium, same ring where he flattened Ernie Schaaf of Boston, less than a month ago, Baer last night definitely eliminated Tuffy Griffiths, game youngster from Sioux City, la, from consideration as a championship contender by a technical knockout triumph in the seventh round. Had Baer cared to, he might even have accomplished the elimination as early as the fourth round. Endowed with all the physical advantages taking his time and taking time out to display his histrionic ability, he literally hacked Griffiths down to defeat. After the first round it appeared apparent that Baer was headed for victory, and after the fourth, when Griffiths was all but out from vicious chops to the body and head, the issue was not in doubt. In the sixth, the bell saved Griffiths more punishment after a straight light hand smash had knocked him into a sitting position. Griffiths' courage, and he had plenty, carried him through one storm after another, but in the seventh, a crushing right to the jaw sent him reeling against the ropes and as he bounced off, another left him rubber-legged and leady for the finishing punch Referee Little Phil Collins stepped in before the decisive punch could be delivered. They traded punches to the head and body in midring with honors even Baer blocked Griffiths' rights and nailed him with a right to the Jaw. Baer charged in close to inflict body punishment Baer drove a left and right to the body. Griffiths tagged Baer with a right to the jaw, Baer threw a left and right to the head and tuffy slipped to the floor, but was up in an instant. Baer clipped two rights to the jaw and caught one in return. They hammered away at each other’s body in midring with Baer tying Griffiths up when they clinched. .Griffiths connected with a left and right to the jaw And drove a right under the heart They slugged in a neutral corner on even terms before Griffiths dropped a right to the Jaw in a furious exchange in mid ring Baer was twice guilty of heeling Griffiths and his tactics brought a round of boos. Baer drove both fists to the body catching a left and right to the head in return They fought in midring, each boxing cautiously with Baer pounding Griffiths around the body when they got in close quarters. Baer landed a right to the bodyand left to the jaw. After trading lefts Giiffiths drove a light to the jaw as the round ended. Baer cracked Griffiths with lefts and rights to the head with Tuffy backing away trying to escape. Baer was trying to win with one terrific punch, but Tuffy was ducking them. Tuffy threw a left and right to the jaw, but Baer merely laughed off these blows Baer crossed a right to the jaw and his next blow accidentally hit Referee Collins on the chin. Baer hooked a left to the body with Griffiths stabbing him to the face with long left in return. They tangled on the ropes trading punches to the head and body. Baer straightened Griffiths up with two short rights to the head. He knocked Tuffy into the ropes with a left hook to the jaw and then crossed a right forcing Griffiths to clinch. Baer floored Griffiths with a right to the jaw he got up without taking a count just as the bell rang. Baer missed a right to the jaw, but walked into Griffiths shooting a left hook to the jaw. He cracked Griffiths with a right to the chin. Baer shook Griffiths with another blast of rights and left to the chin whereupon Referee Collins stepped between them, and led Griffiths to his corner, declaring Baer the winner. Griffiths was heartbroken, and burst into tears as the uneven fight was stopped. 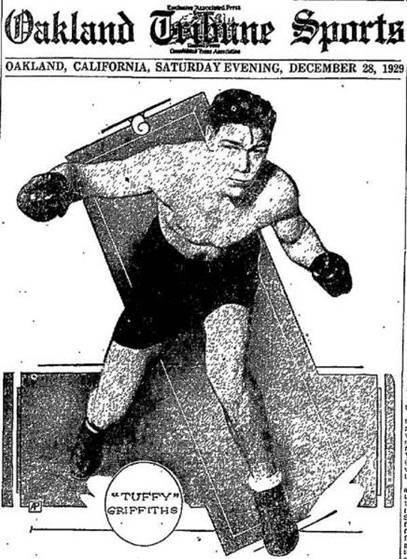 Tuffy Griffiths, the leaden-fisted thumper from Sioux City, Iowa, moved up to the contender class in the heavyweight division by hammering out a point decision over durable Johnny Risko in a hectic ten round battle at Madison Square Garden Friday evening. The fight was the roughest, toughest; give-and-take affair the hoi polloi of the fight racket had seen in many a moon around the city, and at the close both men were roundly cheered. Griffiths fought a heady fight. He had to. Risko piled in time after time when a hard right to the jaw jarred him from head to toe and made the.shock-haired youngster from Iowa call on his reserve .stamina to off set the furious countercharges. The men unlimbered their heavy artillery in the opening stanza and had the fans on their feet shouting deliriously As first one and then the other scored with hard blows. Risko hooked in with long drives to the body as Griffiths danced around getting the range. A sharp driven right collided Risko’s jaw and the fireworks started. Risko was like a stick of dynamite with a spluttering fuse nearing the powder. A crack on the jaw set him off and the subsequent explosion rocked Griffiths fore and aft. A grimace a shake of the head and Tuffy returned to the attack. Rights bounced off Risko'.s jaw repeatedly and the Cleveland battler drove in with heftv wallops to the ribs and body. 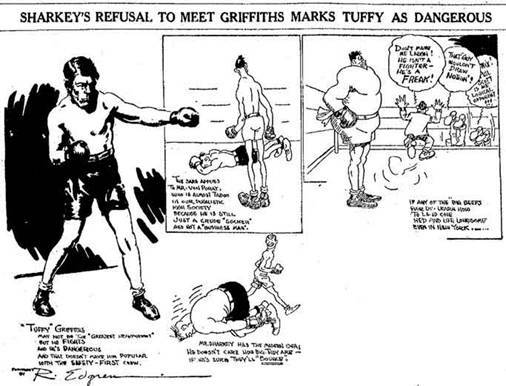 Tuffy showed a superior brand of boxing and managed to keep his charging foe from scoring with any decided effect. A hard left drove Griffiths into the ropes and Tuffy returned the compliment with s a right to the same place. Exchanges enlivened the long range fighting so that the tide shifted frequently. As the bout progressed it was apparent that Griffith's more accurate punching was scoring more in his favor than the club like blows of his stocky opponent. Griffiths was following a carefully planned battle. There were times, and they were numerous, when Risko compelled him to deviate and fight it out in bruiser like style and Tuffy was at a disadvantage. Risko somewhat slower than in other days has no peer in this, style of battling and he showed at his best when he had his man attempting to slug it out in close. In the sixth round Tuffy caught Risko a hard right on the jaw. The durable Bohemian staggered back on flat feet and appeared dazed. Griffiths held off rather than risk another flurry of aimless punches, and it is well that he did. Risko never knows when he is hurt- A short breathing spell or another punch and Johnny is off on another sustained rally. Tuffy had learned in the earlier rounds that it was best to cut his man down methodically, rather than risk annihilation by a wild swing. Griffiths worked on the doughty Riiko carefully and scored effectively with long range blows. Tuffy boxed smoothly in the next round. Risko bulled in with both fists flying and Tuffy backed away smartly permitting the blows to hit empty air. Every time the men went into a clinch Risko would come out fighting. Griffiths ducked cleverly repeatedly and avoided the swishing gloves. The next two chapters were rather even. What edge, if there was any, went to Risko on aggressiveness .A hard right to the body hurt Tuffy and John rushed him against the ropes and nearly shoved him off balance. Before the round was over Tuffy was banging away with his opponent as strong as ever. Risko tried to spurt in the closing round but his strong opponent had plenty of reserve.Tuffy whaled away at Johnny and clinched the decision by the sustained flurry of his attack.